Sadly, such views often are “dominating the discussion and suggesting answers that would lead to an inward-looking, intolerant decline,” Malmstroem said. At the same time, she underlined that trade policy has to listen to new concerns and she promised she would continue to do so. Her full speech is available here [pdf]. A photo of today’s event is available here. She called the new Investment Court System proposed for TTIP “a clear break with the past,” saying it is “protecting the right to regulate” for one. But she at the same time opposed the re-opening of the EU trade deal with Canada to adjust it to the new investment protection provisions. During her stay in Karlsruhe, Malmstroem was presented with 230,000 anti-TTIP signatures which citizens from the southern State of Baden-Wurttemberg have added to the list of 3.3 million anti-TTIP signatures from the 28 member states. Earlier in the day, the trade commissioner participated in the second public session of a TTIP Committee established by the State Government of Baden-Wurttemberg. It was the second hearing for the committee, which brings together representatives from industry, academia, trade unions, churches, farmers, environmental and consumer groups as well as members of the media and the Parliament of Baden-Wurttemberg tackled the area of public services. “Social services, health and education – public services is a concern of all citizens. The trade agreement must not result in any negative consequences local public authorities who want to provide for these services,” Peter Friedrich, state minister for federal, EU and international issues, said during the meeting. Malmstroem has traveled to Germany several times in order to address concerns in the largest EU member state. In December, she announced reading rooms for national parliaments for consolidated TTIP texts in Berlin. 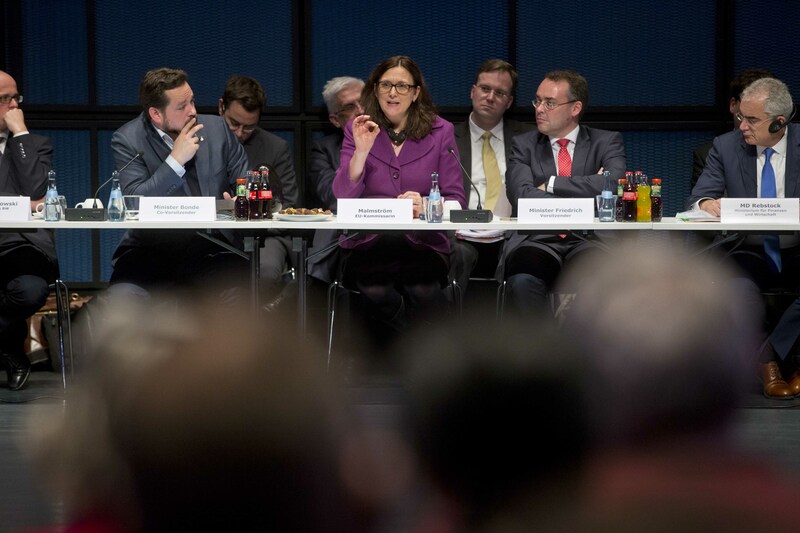 "Trade Commissioner Malmstroem Promotes TTIP, Warns Against Intolerance" by Intellectual Property Watch is licensed under a Creative Commons Attribution-NonCommercial-ShareAlike 4.0 International License. Just look what NAFTA brought to Canada and Mexico. We don’t want that in Europe. Keeping everything in the dark, leave the decision in the hands of the few who are influenced by a mighty and rich lobby of the cooperation’s and rejecting an ECI in 2014 doesn’t bode well. I live I Canada and don’t see any of the issues you’re referring to with NAFTA. Can you back those statements up with facts? The North American Free Trade Agreement (NAFTA) elevated corporations in signatory countries to nationhood status by allowing them to make investor challenges in ISDS tribunals. As a result of NAFTA, and other trade treaties that have this mechanism, corporations can challenge a government directly rather than petition their government to do so on their behalf. Only foreign corporations have standing. A domestic corporation can not challenge it’s own government. A NAFTA ruling favorable to the corporation would direct the losing government to pay a fine. Fines are paid out of taxpayer dollars and range from multi-million to multi-billion dollar settlements. If the government refuses to pay the fine, their assets abroad can be seized. She’s a bigger fool than I thought. So the intolerant and extremists are those who don’t want to see the nation state or even the EU controlled in the interest of foreign corporates? In the UK alone the opposition to TTIP consists of socialists (Jeremy Corbyn, John McDonnell, the TUSC), Labour figures like Andy Burnham, The Green Party, Trade Unions such as the RMT, ASLEF, FBU, POA, Unite, Liberals (such as Charles Kennedy before his death), patriots and nationalists from UKIP (Nigel Farage, Douglas Carswell, Stephen Woolfe, Gerard Batten), Conservatives such as Zac Goldsmith, Bill Cash and Peter Lilley. Are all of those people extremists? Are they all intolerant? That is about as wide a range of political voices as possible. Or is it just the views of Mandelson / Clegg / Osborne which are considered acceptable now? The real issue is that the EU does not strongly advocate for her interests. While the US made no concessions on their protectionism so far: Berry Amendments, Buy America, Export quota for gasoline they strongly defend their interests in a way that would seriously damage European sovereignty. The term Free Trade Agreement is a joke.